Jaguar’s latest XE SV Project 8 is officially the fastest production four-door saloon around the 12. 9-mile Nürburgring Nordschleife. The limited edition XE set a new lap record of 7m 21.23s, taking the crown from the Alfa Romeo Giulia Quadrifoglio by almost 11 seconds. Under the hood of the XE Project 8 is a 592bhp 5.0-litre supercharged V8 with an eight-speed ZF gearbox and four-wheel drive. Jaguar says the Project 8 does 0-62mph in 3.3 seconds and hits a 200mph top speed. To slow things down, the Jag has a set of carbon ceramic brakes fitted as standard. There's an optional, weight-saving Track Pack which removes the rear seats and throws in two carbon fibre racing buckets with four-point race harnesses for the driver and passenger. 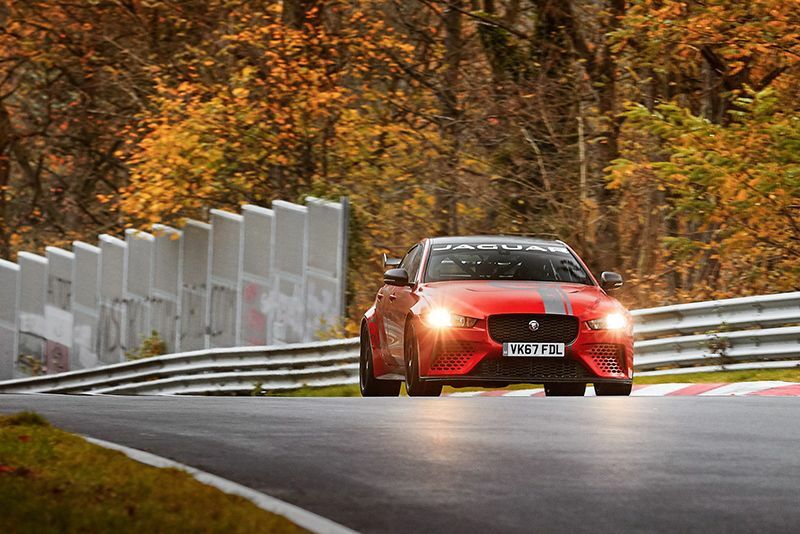 There will be only 300 Project 8s and all will be left-hand drive. Best you get your order in quickly because over 100 had already been ordered before the car was revealed at the Goodwood Festival of Speed a couple of months ago. The Project 8 may well be one of the most expensive at £149,995, but it's also one of the most powerful, and now it's the fastest in class too. Hop on board in the video below to see the Jag take the title. Video: Ekanooracing's Fastest Gtr On The Planet Is The Ultimate Speed Demon!